If you need a quality portable amplifier that will give your dance classes a big boost, look no further. The Dance Combo amplifier can easily tick all your boxes: portable, practical, powerful, easy to use and reliable. Get high volume and crystal clear sound inside your own studio. Although it's ideal for medium-sized halls, it can do so much more. The internal rechargeable battery and the built-in trolley make taking it outside child's play. And if you want to use it for big performances, you can add 2 extra speakers to make sure everyone in your audience will be rightfully impressed. We took 2 years asking dancers and instructors all over the country what they required and how they needed its packaging. We are pleased to say the feedback is amazing. Everyone who has used it is impressed and we want to share this product with you. It has to be tried and compared to believe us. 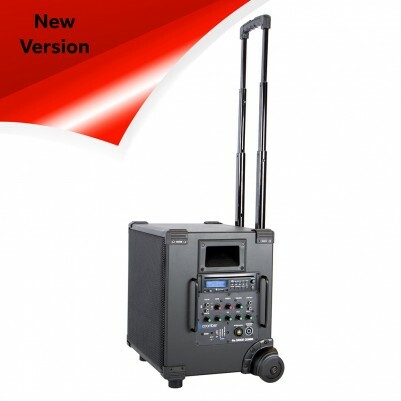 This compact truly portable rugged PA is so versatile but perfect for every application in dance schools and dance performance its so simple to use with genuine impressive results. It will fill most drama studios and halls with sound on its own but can be connected to one or two of our 430 speakers to double the power and distribute the sound. The clarity of the voice and bass response has impressed many critics of audio equipment, it does truly enhance the performance and the users credibility by being heard clearly and using a professional quality British made audio. Here is an example of the system being used outside in the town centre of Worcester by our friends from Dancefest.